I have many Jewish friends. As such, I have been invited to a number of special celebrations over the years – Passover, Sukkot, Rosh Hashanah, Hanukkah, and of course the special Friday night meal, Shabbat. These have generally involved meals around the family table. Food and whanau – two of my favourite things. I had previously been invited to a Bat Mitzvah celebration, (the ‘coming of age’ celebration for girls) which I was unable to attend, so it was only recently that I had the opportunity to attend a Bar Mitzvah for a friend’s 13 year old son, Isaac. I knew the morning Shabbat service would be a long affair and that protocols surrounding arrival times were fairly relaxed, but still felt obliged to show up for the 9.30am start – so too did a number of other non-Jewish invited guests. It was nice to know that I wasn’t the only newbie to this special event. Attending Shabbat is quite unlike attending a church service. The first notable difference is that people feel free to stand up, move around and have a quick chat with friends, while the official proceedings are going on. It seems to be the place for a weekly catch-up. Given that the meeting went on for a good three hours, there was plenty of time to reflect on similarities and differences. For the most part, the service reminded me of a hui: listening (for hours) to whaikōrero from elders, trying to understand the reo (in this case Hebrew), enjoying the punctuation of songs at key junctures of the proceedings. There were even similarities in the seating arrangements for men and women, the sense of formality offset by casualness, the grace towards children’s comings and goings, or enjoying cuddles with parents. 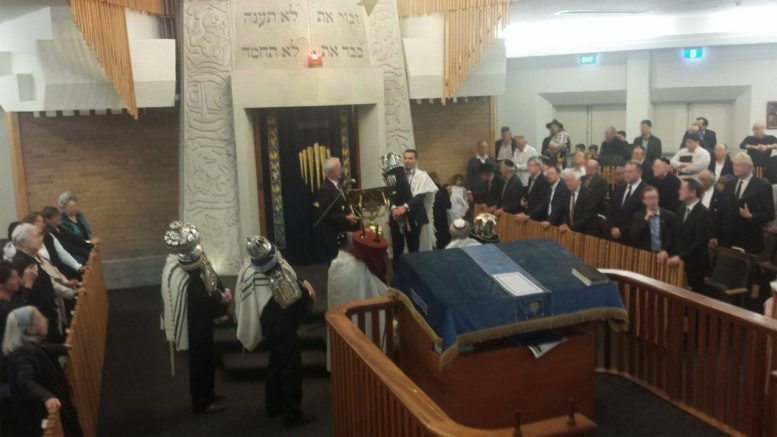 There was the reverence towards taonga, (the Torah scrolls), the remembrance of dearly departed loved ones, the importance of whakapapa connections. The importance of one’s forebears (tipuna) was obvious and was acknowledged. Of course, I’m not the first to note the similarities between Jewish and Māori culture. Samuel Marsden drew up a list of cultural parallels between Māori and Jews and other missionaries noted similarities in language and metaphysical concepts. But what stood out most of all on this particular Saturday morning, was the significance of this ‘rite of passage’ – the transition of a child into adulthood and the declaration of acceptance of responsibility for one’s own moral actions from this time forward. The young Jewish man (or woman, who celebrates Bat Mitzvah), must now begin to exercise his or her will and take responsibility for his or her actions and choices. The commitment is also made, that as part of the community, he or she will ‘give back’ and contribute to its well-being. Around this young man gathered an entire community – parents, extended family, friends, mentors and spiritual leaders – to witness and celebrate this pivotal event. Isaac had spent months with the Rabbi and other mentors, learning special prayers and blessings to recite in Hebrew. He then delivered an inspiring speech. The call to stand proud in his identity as a Jew resonated with the desire of my own extended whanau to see our rangatahi (youth) stand proud as Māori, (Te Arawa proud in our case). Of course, this preparation and community support did not just appear from nowhere, as this young man approached his teens. Isaac and his community had been in preparation from the day of his birth. The raising and education of children is highly valued in Jewish communities and it is not surprising that Jewish women have figured prominently in community organisations focussed on the well-being of children – such as early leaders in the Plunket movement, Marie and Dorothy Theomin and Simone Nathan, and in our day, Dame Lesley Max and Diane Levy. Though always a tiny minority within New Zealand (never more than 0.5 percent of the population), Jews were amongst the earliest settlers and their contribution to society has always far exceeded their small numbers. As I shared this amazing experience, a comment was made by a non-Jewish friend, that if we would practise Bar Mitzvah in New Zealand perhaps our youth would not be so troubled, insecure, lonely, lost and suicidal. Maybe it would help them to take ownership and responsibility for the lives in the safety net of loving adults, encouraging them to become mature and responsible young adults. I couldn’t agree more. With a youth suicide rate ranked second highest in the OECD we have a serious problem on our hands – one that demands solutions. Yet within New Zealand’s increasingly diverse society exists this powerful example, from which much could be learnt. – This article first appeared in the NZ Herald, in abridged form. Sheree Trotter and her husband, Perry, are co-founders of Shadows of Shoah, an artistic, educational Holocaust Trust. She has four children and is currently completing an M.A. in History at the University of Auckland.